The whole thing started when she was 48 years old and found the first baby, a little girl when she was out collecting rubbish. The baby was just lying amongst the junk on the street, abandoned. The baby would have died had the woman not rescued her and taken her in. Lou Xiaoying, now 88 years old and suffering from kidney failure, found and raised more than 30 abandoned Chinese babies from the streets of Jinhua, in the eastern Zhejiang province where she managed to make a living by recycling rubbish. 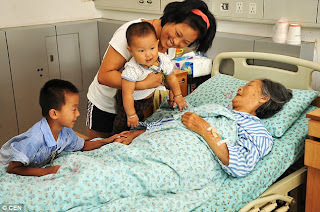 Her youngest son Zhang Qilin - now aged just seven years old - was found in a dustbin by Lou when she was 82 years old. Even though I was already getting old I could not simply ignore the baby and leave him to die in the trash. He looked so sweet and so needy. I had to take him home with me, she said. I took him back to our home, which is a very small modest house in the countryside and nursed him to health. He is now a thriving little boy, who is happy and healthy.